On a damp Monday afternoon in a bustling café in a small village deep in the Ardennes highlands of southeast Belgium, I was enjoying my first beer of the day. Houblon Chouffe, a Belgian IPA, offered an interesting interplay of noble and American hops and spicy Belgian yeast. The 9% ale, produced at Brasserie d’Achouffe, located just up the road, was pleasantly warming after spending a wet morning exposed to the elements. Several of my travel companions were sipping whipped cream-topped hot drinks made with Chouffe Coffee, a coffee liqueur concocted from distilled Chouffe beer. Outside, the downpour that had prompted our group of six to make an unplanned beverage stop a mile short of the bed and breakfast where we would spend the night was beginning to lose its intensity. For typical travelers on a Belgian beer holiday, a rain shower would be of little concern. After all, in Belgium, rain is not so much a question of if as it is of when and how much. However, our group of travelers was hardly typical, as evidenced by our shared fashion statement featuring variations on a theme of spandex. We’d arrived by bicycle as part of a guided beer-themed bike tour dubbed the Ardennes Trappist Challenge by the tour organizer, Beercycling. Our itinerary on the eight-day, seven-night, beer-intensive adventure featured over 200 miles of cycling, averaging 35 miles per day, through the Ardennes in Belgium’s southern province of Wallonia. With the exception of a single day of on-and-off showers, the weather gods were merciful, with warm dry days throughout the tour. While not all beer enthusiasts are into bicycles, a large percentage of cyclists are into good beer. At least that’s been my observation, having long ago discovered the joys of both fine beer and two-wheeled recreation. For those with a passion for both beer and bikes, cycle touring can make for a rewarding beercation. En route to your various destinations, you can drink in the sights, smells and rhythms of an ever-changing landscape that would typically whoosh by unnoticed from the enclosed space of a car, bus or train. Furthermore, when your destinations are breweries, beer bars or other beer-related stops, you arrive with your senses piqued after an invigorating session of physical activity. Surprisingly, Belgium is as overlooked by cyclists as a bike-touring destination as it is revered by beer travelers as a beer-touring mecca. In Flanders, Belgium’s Dutch-speaking Northern province, the landscape is virtually flat and dissected by an extensive network of quiet bike paths called the fietsroutes (“fiets” is Dutch for bicycle). In Wallonia, Belgium’s French-speaking Southern province, the lightly traveled roller-coaster roads of the Ardennes provide a more challenging experience for seasoned cyclists. Since this is Belgium, both North and South are dotted with breweries, beer cafés and, of course, the famed beer-producing Trappist monasteries of international veneration. As potentially attractive as Belgium is for the beer-focused cyclist, organizing bicycle travel from afar can be a daunting task. Route planning in unfamiliar territory, arranging bike rentals and overnight lodgings and compiling a bicycle-friendly itinerary of brewery tours and beer stops are among the many logistical hurdles facing foreign cyclists. Enter Beercycling. 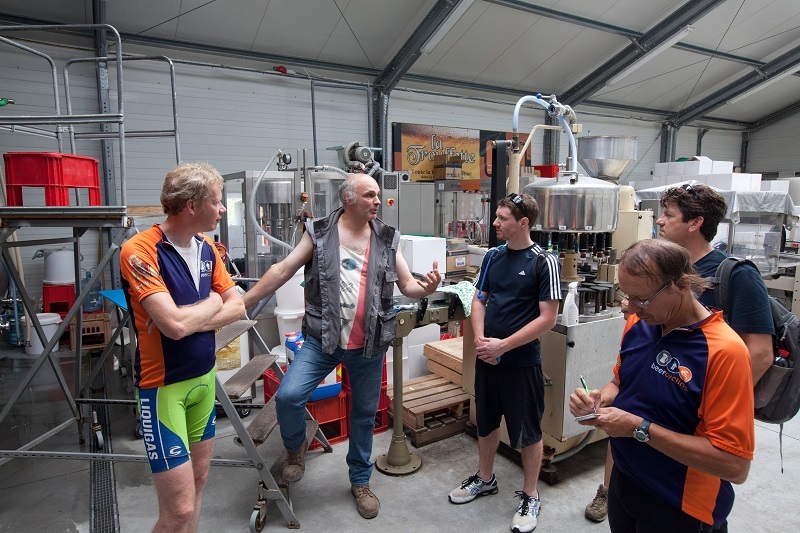 This small tour company came to life in 2011 with a focus on providing guided beer-intensive bicycle tours of Belgium and the Netherlands. In its first few seasons, Beercycling offered a variety of multi-day outings through the Flemish flatlands suitable for novice-level cyclists. In the summer of 2014, Beercycling upped the ante, and the elevation, with a new tour nicknamed the “Ardennes Trappist Challenge.” The itinerary promised a “physical challenge” coupled with “outstanding scenery, beers and breweries” in the hill country of southern Wallonia. With my tour fees paid for by the Belgian Tourist Office-Brussels/Wallonia, I signed on for the new venture. On a late July morning, our group of thirsty travelers convened in Brussels, but didn’t linger long in the busy city. A two-hour journey by train and bus brought us to Rochefort, where our Santos touring bikes were waiting. We would overnight here and begin our trek through the Ardennes in the morning. In the hotel garden, we primed our palates for the week ahead with bottles of the three locally produced Trappist ales. Rochefort 6, 8 and 10 were each charmers in their own way, dark, alluring and full of character. Do Trappist ales always taste better near their source? On this day, it certainly seemed so. The Ardennes is a sparsely populated region of tall, rounded hills painted with a patchwork of dark pine forests, rolling farm fields and green pastureland dotted with grazing cows and horses. Obscure backroads, riverside bike paths and former railway corridors provide bike-friendly travel routes through the bucolic landscape. Often, the rolling hills and river valleys were reminiscent of rural New England. In places where freshly cut logs were piled high along the roadside amid dense thickets of wild berries, the Pacific Northwest came to mind. If forest, farmland and pasture were recurring themes throughout the week, there were countless variations on these themes, and the scenery never got tiresome. Our first ride, from Rochefort to the lively riverside town of La Roche-en-Ardenne, had much in common with rides that would follow in that it was scenic, relaxed and entirely pleasant. Just a mile out of Rochefort resides Abbaye Notre-Dame de Saint-Rémy, aka Rochefort Abbey. Saint-Rémy is home to one of the world’s 10 Trappist breweries. As is typical for Trappist beer makers, proceeds from beer sales are used to maintain the abbey and to support charitable causes. The grounds of Rochefort Abbey are quiet and serene. Since much of the site, including the brewery, is off-limits to tourists—which is also typical of Trappist enclaves—there’s little reason for an extended visit. If your timing is right and your visit coincides with Mass, you can enter the church and experience the monks’ ethereal chanting. A sustained late-morning climb topped out in the quiet hilltop village of Soy, home of Brasserie Fantôme. The small rustic brewery, known for its unique and ever-changing variations of saisons, resides in an old farmhouse. Since we were only partway through our ride when we arrived for a picnic lunch, our beer sampling was, by necessity, an abbreviated one. A witbier flavored with grapefruit juice was refreshing after the morning ride. An amber-hued saison offered subtle tartness along with bright flavors contributed by a blend of unidentified spices. Few old buildings survived the widespread destruction inflicted on the Ardennes during World War II. However, on a rise high above our evening destination of La Roche-en-Ardenne sit the ruins of a medieval castle. According to local lore, it’s haunted by a ghost. On summer evenings, the being from beyond makes a dramatic appearance outside the castle as part of a light show visible from town. The production is a bit cheesy, but, over a few beers on the patio of a streamside café, entertaining nonetheless. The short, rain-punctuated 20-mile ride from La Roche-en-Ardenne to Achouffe began, as most days began, with a pulse-quickening climb out of town. Climbs are an ever-present part of cycling in the Ardennes, though few are extreme in length or incline. While individual climbs won’t bring you to tears in this terrain, the cumulative effect of hours of up-and-down riding is pleasantly fatiguing for a moderately fit cyclist, and certainly thirst-inducing. By day’s end, you’ll feel like you’ve earned your beer. The many slow climbs and quiet sections of peaceful pathways provided ample time to get acquainted with my five travel companions. “I’m from Milwaukee originally, so I think [I have] 50 percent beer in my blood,” explained Amy Cook, a 40-something advertising executive and marathon runner from Costa Mesa, California. Her partner, Cameron Kurth, is an automotive engineer and homebrewer. The youngest of the group was Tom Boylan, a 23-year-old manager of a North Brunswick, New Jersey, homebrew shop on his first European getaway. Our two personable guides, American Evan Cohan and Henk Wesselink of the Netherlands, took turns riding and driving the support vehicle containing our luggage, picnic lunches, mid-ride snacks and whatever interesting beers we happened to acquire along the way. As a Colorado-based beer and bike disciple, and soon-to-be sexagenarian, I was the group geezer. With our shared interests in beer and active travel, conversations flowed easily, both on and off the bikes. Typically, there would be one brewery stop planned each day. But on our second day of cycling there were two breweries on our agenda. Brasserie d’Achouffe is a large modern facility. The brewery was founded in 1982 and expanded and upgraded after its purchase by the Duvel Moortgat group in 2006. As our guide took us through the brewery, I was impressed with how she effortlessly switched from Dutch to fluent English to accommodate the multinational group of brewery visitors. The Chouffe brand is easily recognized by the red-hatted, white-bearded gnome character that appears on bottle labels, glassware, all manner of brewery swag and even as wooden statues along the roadside outside the village pointing the way to the brewery. Post-tour tastings of the distinctive and delicious Chouffe ales are conducted in L’Auberge des Lutins, or Café of the Gnomes, in the brewery complex. When drinking Chouffe beer, it’s imperative to have the gnome on your glassware facing you, lest you wake up in the morning with a headache, our server informed us over a pour of Chouffe Soleil, an easy-drinking spiced summer ale. A dirt pathway that skirts a cow pasture connects Brasserie d’Achouffe with the diminutive Brasserie Inter-Pol and the adjacent La Vieille Forge Bed & Breakfast. The two businesses are operated by Pol Ghekiere and his wife, Tine. 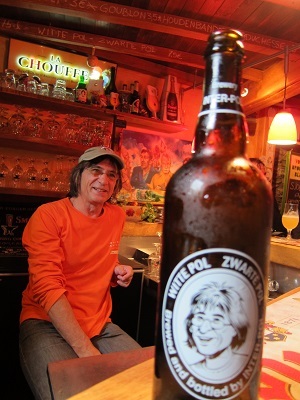 Before starting the brewery in 2007, Pol spent 10 years as a guide at Brasserie d’Achouffe. His compact, ingeniously designed 16-gallon brewhouse is Belgium’s smallest commercial brewery, our host informed us. The old stone buildings that house the brewery and B&B date from 1710. The brewery shares the building with a cozy pub, Au Grand Café, where visitors can sample the Inter-Pol beers along with a small, but top-notch selection of other Belgian ales from breweries such as Boon, Rodenbach and Orval. During our visit, the house beers included Witte Pol, a well-crafted witbier, and Zwarte Pol, a not-too-sweet milk stout flavored with cocoa. A third beer, a peated ale, paired nicely with the salmon, rabbit and garden veggies that Tine had prepared for our dinner. Despite its petite size and remote location, Inter-Pol is hardly undiscovered. A guest book kept in the pub contained entries from scores of prominent U.S. and international brewers. A morning ride to the historic town of Bastogne featured a gentle eight-mile stretch along a section of the RAVel, a network of former railroad corridors converted to paved pathways. Pedaling through the peaceful landscape of farms, fields and forests, it was difficult to envision the intense fighting that took place in the area during World War II. The bloody Battle of the Bulge, which began in late 1944, was fought in the countryside and villages around Bastogne. U.S. forces suffered 75,000 casualties before the German advance was eventually thwarted. The scenery between Bastogne and Neufchâteau was atypically uninspiring. However, a late-afternoon visit to Brasserie de Bastogne, located on a farm a few miles from town, was one of the week’s unexpected highlights. The small brewery was founded in 2008 and resides in an unglamorous metal structure. A collection of awards garnered in Belgian competitions hangs on an interior wall. There’s no formal tasting area, but tours are available by reservation. As farmer and brewery co-owner Philippe Meurisse led us through a sampling of the brewery’s diverse portfolio, he was asked what had motivated him to build a brewery on his farm six years prior. “Farmers are alone, but with beer, many people,” he responded in a thick French accent. While the Belgian beer industry, in general, may lack the cooperative spirit that permeates the brewing scene in the United States, there are exceptions. The yeast Brasserie de Bastogne uses to produce its agreeable ales is provided by the esteemed Trappist brewery, Orval, the next destination on our itinerary. The undulating half-day ride to the abbey cut through a section of dark forest where the fragrance of freshly cut pine was so thick and pungent, it was almost intoxicating. 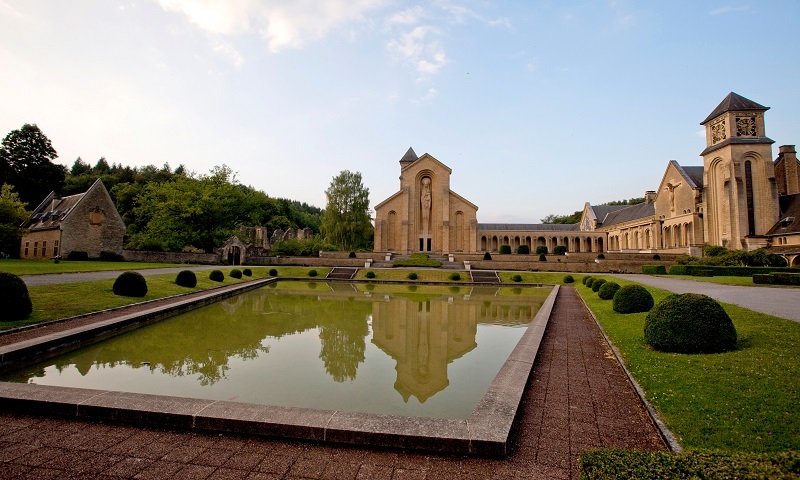 Of Wallonia’s three beer-producing Trappist monasteries, Abbaye Notre-Dame d’Orval is the most accommodating to visitors. Despite its off-the-beaten-path location along the French border, it’s a popular destination for European travelers. The Orval abbey dates from the 12th century, and over the years has endured several periods of destruction and rebuilding. Today, the site contains extensive ruins of medieval structures that are well worth exploring. Also on the grounds are a medicinal herb garden, an art gallery and two museums, including a brewing museum, all open to the public. The brewery is operated by laypersons under the auspices of Brother Xavier, one the abbey’s 12 resident monks. He happened by on a bicycle, appropriately enough, as we were enjoying beers at A l’Ange Gardien, the busy café within sight of the abbey. The café serves the wonderfully complex, dry-hopped Orval beer a variety of ways; young, aged, cold and cellar temperature. The café offers a chance to sample Petit Orval, the small beer, or patersbier (Fathers Beer), brewed for the monks to enjoy in the abbey. Our final ride of the week was a long, draining 65-miler from the bustling waterside town of Bouillon to Scourmont Abbey, home of Chimay. Much of the day was spent crossing a section of France that protrudes into the Belgian countryside. A walk through the abbey’s meticulously kept grounds was a pleasant diversion after a long day in the saddle. A peaceful path through a pine forest connects the abbey with L’Auberge de Poteaupré, the inn and café associated with Belgium’s largest Trappist Brewery. The tour would officially end the next day with a train trip back to Brussels and a visit to the storied lambic-producing Brasserie Cantillon. As if in defiance of the trip’s conclusion, after the café closed for the evening, we lingered at our table, methodically working our way through a sizable collection of beers we’d accumulated throughout the week. Amy and Cameron had been logging each new beer they had sampled in Belgium. By night’s end, their log exceeded 80 entries. Traversing the Ardennes by bicycle on a brewery-hopping holiday may not be for everyone, but for beer and biking fans with a taste for active travel, the journey has a lot of ups and downs. And that’s the whole point. Love the thoughtful verbiage used in the article to describe a fabulous trip, and a wonderful tour company as BeerCycling. I am excited that you were able to experience this tour, as my hubby and I did as well, in August. We have also traveled on the 10-day Tour in Flanders a few years back with BeerCycljng. And the only word we continue coming back to when people ask about our trips is to say that the experiences have been epic! Great article – 5thnaks for highlighting this tour! Cheers! Amazing tour! My husband and I just did the 10 day Flanders tour for our honeymoon. So many memories shared with amazing people and fantastic guides, Evan and Henk.